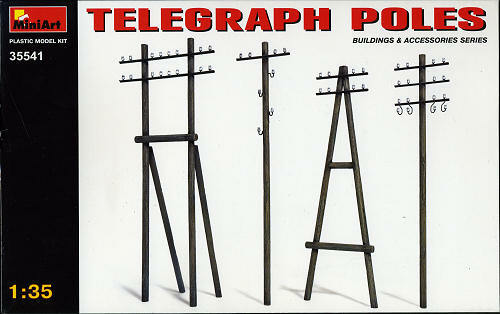 Adding to a growing list of accessories for the diorama builder, MiniArt continues with this set for Telegraph Poles. Actually, they are Utility poles that carry more than telegraph wires as it seems this would be good for phone lines and electrical lines. These are not a US design as I don't ever recall seeing the u shaped brackets for the single insulators. These do, however, seem to have all white ceramic used for the insulators. 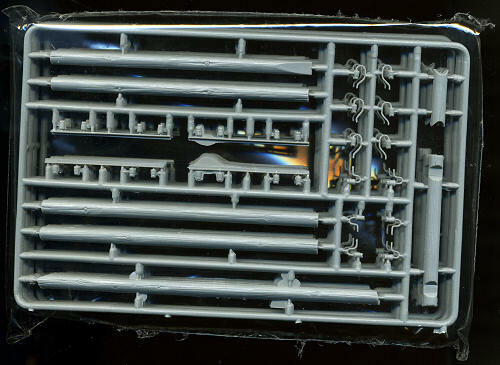 The box states that two sets can be made from the four sprues that are included. It is a bit more than that. True, the two designs that use double poles can only have a pair made from what is included. However, if you are going to do a single pole design, you should be able to get four poles out of this kit. The kit itself is very nicely molded though you will notice the the cross-over insulator sections do have some flash on them that will need to be cleaned. There are no holes drilled for the single insulator pieces so those will have to be done by the builder. It takes all sorts of bits and pieces to make a good diorama and if yours requires these poles, then you now have an excellent source. http://en.wikipedia.org/wiki/Utility_pole has a lot of interesting information on the subject. Thanks to www.dragonmodelsusa.com for the preview set. Get yours at your local shop or on-line retailer.